Kewra oil is widely used in several sweet dishes as a flavouring agent and is also used in many medicines. The fixative properties of the kewra oil are well known and it is used as an important ingredient in the perfume industry and also in aromatherapy applications. The oil is a known antiseptic, antibacterial, antispasmodic and stimulant and is used for the cure of rheumatoid arthritis. Kewra oil has many therapeutic uses and through these uses one can stabilize the mind and body. Kewra oil is good for moisturizing the skin because the oil has the power to go in deeper inside the skin. Kewra oil is used widely as a moisturizer in fairness creams, crack creams, burn ointments and many other cosmetics. It can be mixed and used with the regular creams and it can be mixed with rose water to make a perfect face wash. The use of kewra oil on the skin helps to attain a soft, glowing and healthier skin. 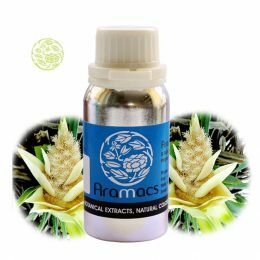 This is an extract distilled from the flower of the pandanus plant and is used in North Indian and Pakistani sweets as an ingredient and Bangladeshi and Pakistani meat dishes. In India it is widely used for Biryani, Awadhi and Hyderbadi-Lucknowi dishes. The male flowers of the pandanus is exclusively used for kewra distillation and the majority of the flowers, almost 95% of the total kewra flowers exported from India is plucked from areas nears Berhampur city in Ganjam district in the state of Odisha. The coastal area of the Chhatrapur, Rangeilunda, Patrapur and Chikti are popular for their aromatic pandanus plantations. The flowers from the coastal areas have an exquisite floral note and the most popular varieties are the pandanus cultivated in Gopalpur-on-sea. In Ganjam district there are nearly 200 registered kewra distillation factories and cultivation of kewra flower is a major source of income for the people there. Kewra is also used as an ingredient in attar. Attar is a perfume popular in Arab and other Muslim countries and is popular among perfume experts globally. Attar produced from kewra is popular and rare and is supposed to facilitate lifting of creative blocks for artists and writers. Kewra flower has a smooth and refreshing odour which resembles that of rose, hyacinth and honey. The plant family is Pandanaceae or screw pine family and it smell is fruitier than the rose flower oil smell. 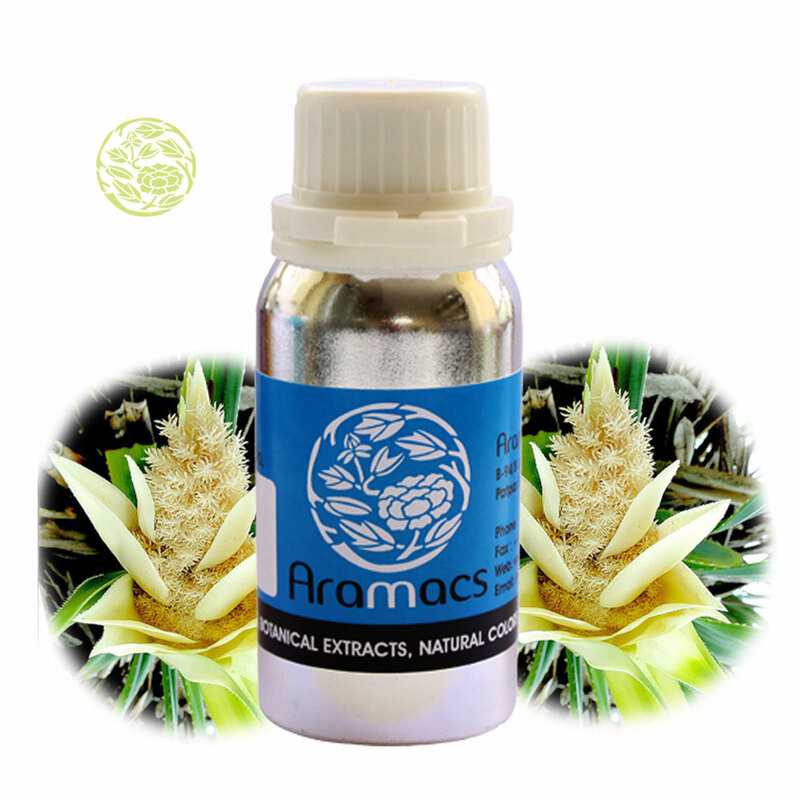 Kewra water or the pandanus flower water which is the aqueous distillate is quite diluted and can be used by the teaspoon or tablespoon. The main constituents of pandanus flower oil or the kewra oil is dominated by 2-phenylethyl-methylether (β-phenyl ethyl methyl ether, 60 to 80%); minor com­ponents are the free alcohol, 2-phenyl­ethanol (β-phenyl ethyl alcohol) and its acetic acid ester; 2-phenyl­ethanol is also an important aroma component in rose water. Because it is well soluble in water, 2-phenyl­ethanol can be captured in aqueous distillates quite easily. Furthermore, monoterpenes are present to contribute to the fragrance. The most important terpene in pandanus flowers is terpinene-4-ol (up to 15%); furthermore, α-terpineol, γ-terpinene and dipentene are also seen. There are many species of Pandanus which grow in tropical regions of Asia, Australia and the Pacific and one of the species has a fragrant leaf which is used as spice. The genus that provides the fragrant kewra water is P. odoratis­simus, and this genus of kewra grows in large number along the Indian East coast. It is also found along the Indian West coast and Sri Lanka but in lesser quantities. Further inside the land, it becomes rarer, but scattered specimen grows all over the plains of the Eastern half of North India, including the lowland of Nepal (Terai). P. odoratissimus is considered as a fragrant subspecies of P. Tectorius Parkinson, which is distributed much wider up to Australia and Polynesia. Pandanus is a genus of monocots and there are more than 750 accepted species. 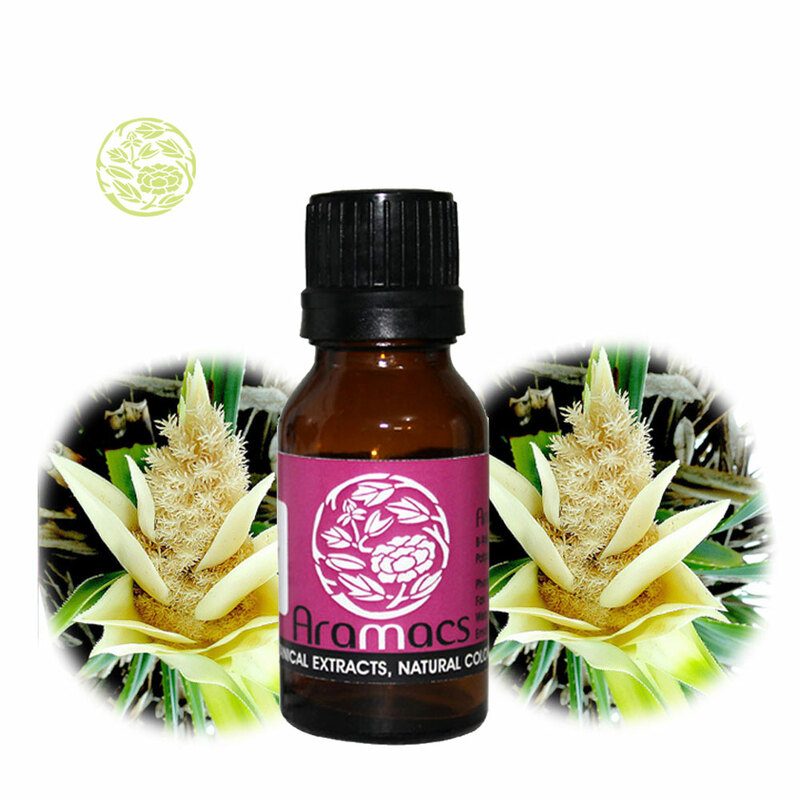 The botanical name is Pandanus fascicularis Lamk and it is known in different names in different parts of India and the world. In Bengali it is known as Keora, Keya and Ketaki, in English it is known as Umbrella tree, screw pine or screw tree, in French Pandanus, in German Schraubenbaum, Schraubenpalme, in Hindi Kewra, Kewda, Pushpa-chamar, Keora and Panshuka, in Marathi Ketaki, Kewda and Kegad, kia or kiya in Oriya and kiura, kevara, jambala, jambul, panshuka and ketaki in Urdu. Pandan is used for handicraftsand the craftsmen collect the pandan leaves from plants in the wild. Only the mature leaves of the plant are cut so that the plant will regenerate naturally. The leaves harvested from the plant are sliced in fine strips and sorted for additional processing. Weavers in different parts of the world create basic pandan mats of standard size or roll the leaves into pandan ropes for other designs. This is followed by a colouring process, where the pandan mats are placed in drums with water-based colours. After drying, the coloured mats are twisted into final products, such as place mats or jewellery boxes and the final colour touch-ups are done later on.